Dr. Kali Pradip Chaudhuri’s path to success in the medical field has been a roundabout route that began in India and has lead him to locations around the world, including the Hemet and Menifee valleys. Despite his route being marked with some delays, detours and a dollop of controversy, he has shown a steady hand with a stethoscope, a scalpel and the management and entrepreneurial strengths needed to help shape the medical and real estate fields amid the tumultuous 21st century. “This is a story of us, not a story of me,” he said in a recent interview. The subject of this story is the chairman and founder of the KPC Group of Companies. The value of his ventures well exceed several billion dollars, and they stand to increase further when a still-unfolding Corona development plan reaches its full potential. Dr. Chaudhuri came to America in 1974 in what he describes as a transformational experience. “I left India in the middle of the night and woke up to a land of light,” he recalled. While much of India is mired in abject poverty, he was fortunate to have been born into a family of means. That afforded him the opportunities to further his education and start acquiring what has now become a vast portfolio of properties. Although India and China are quickly gaining ground, he believes the United States is the greatest country in the world. “I am very proud of America, and I believe 80 percent of the world’s innovation has come from America,” he said. He began his undergraduate and medical education in various Indian institutions. From there, he burnished that work with studies in Malaysia, England, Canada and the United States. He has practiced orthopedic surgery since 1982. He is certified by the American Board of Orthopedic Surgeons and is a fellow of both the American Academy of Orthopedic Surgeons and the American College of Surgeons. 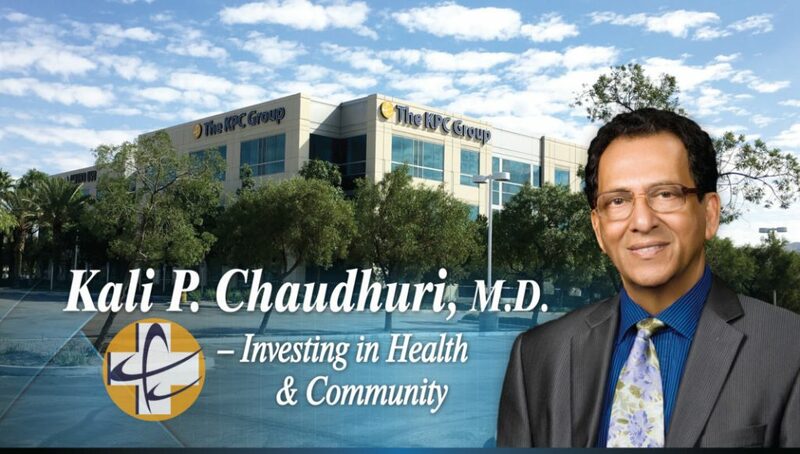 After relocating to Southern California, Dr. Chaudhuri and his wife, Sunanda, purchased a home in Palos Verdes, a commercial building in Long Beach and began what he describes as increasing his “footprint” in the diverse fields of medical services and facilities, pharmaceuticals, architecture, agriculture, alternative energy and travel. As he began to increase his U.S. holdings, he has also kept one foot firmly planted abroad. He opened the first private medical school in West Bengal, India. His Kolkata hospital and medical and nursing college anchors 25 acres in that city. His firm’s Chemgen Pharma International has partnered with interests based in Spain, Germany and India. His entities have a combined payroll of more than 20,000 workers today. His first foray to Hemet was in 1984. At that time, the city was a bucolic enclave of retirees and young families at the foot of a wall of rock-strewn slopes. He was invited to a party, and had been told that the drive from Laguna Niguel would take about three hours on the serpentine Highway 74. The drive to Hemet took less time than he expected. That left Dr. Chaudhuri ample time to explore the area and savor its scenery and ambiance. Then he discovered the hospital that had long served the cities of Hemet and San Jacinto as well as their surrounding unincorporated enclaves. It was love at first sight, he recalled. Soon after, Dr. Chaudhuri connected with the then chief of staff, who noted a need for primary care physicians and internists. Dr. Chaudhuri said he was told those specialties, as well as psychiatry, were the typical path of entry into the Hemet area market for foreign-born doctors. That welcome became decidedly chilly, however, when Dr. Chaudhuri told his contact that they shared the same specialty, orthopedics. He said he seemed to hit a brick wall when he went ahead and applied for admission credentials to practice at Hemet hospital. He was baffled over how it took just five weeks to receive clearance to practice at UCLA’s prestigious medical center yet nearly a year had passed without receiving a similar blessing from Hemet. Dr. Chaudhuri said he initially suspected that the wheels had slowed in the approval process because he was an outsider. But then he wondered whether it was because he was seen as competition by a top administrator and surgeon at the Hemet center. That changed, he said, when his Hemet medical colleague faced an insurmountable professional challenge when one of his relatives suffered a severe arm injury. A recommendation was brought forward to contact Dr. Chaudhuri, whose consultation led to the patient’s recovery. Dr. Chaudhuri said his colleague was so relieved that he offered a teary apology and vowed to break the certification logjam. He said that doctor and others soon recognized his surgical abilities, organizational leadership and business acumen. A short while later he was offered leadership positions at the hospital. His lengthy resume soon included the chairman positions at Hemet Valley Hospital’s surgery department and the orthopedic department of the Hemet Community Medical Group. Likewise, he was listed as a faculty member at the Loma Linda University Medical School. Dr. Chaudhuri, his wife and two children, Kali Priyo and Sumanta, soon moved to Hemet. Like many community hospitals, an array of factors caused a financial squeeze to grip Hemet’s facility. An administrative reorganization helped, but Dr. Chaudhuri said he realized that the conservative structure of a hospital district was unable to respond to the challenges that exist in today’s fast-changing medical services industry. The hospital district model included several shortcomings, he said. Directors elected from the community often lacked the expertise to understand and manage such complex medical operations, he said. “If the board of directors ran the hospital like a traditional business, it would still be a district hospital,” he mused. He has bumped into some naysayers along the way. His focus began to shift from providing direct medical care to management and acquisition activities. In late 2010, Dr. Chaudhuri and his group acquired Valley Health System, Hemet Valley Medical Center and Menifee Valley Medical Center, pulling it out of bankruptcy. He and his partners had previously acquired four Orange County hospitals. The latest score along those lines came via the acquisition of Victor Valley Community Hospital in Victorville. In each of these cases, Dr. Chaudhuri and partners were successful in turning around financially troubled hospitals, thus enabling them to continue as viable providers of care to their communities. Dr. Chaudhuri is also planning ancillary projects around the Hemet and Menifee hospitals and making bold forays into such far-flung business fields as commercial real estate, resorts and hotels, educational institutions and retirement and assisted living facilities. Development plans along those lines including making Hemet Valley a teaching hospital, which would include a medical school. He envisions a campus-like setting that spans several blocks around the hospital. Inside the facility, a similar array of improvements include a cardiac center, a wound center, an assessment center and a community dialysis center. Meanwhile, Dr. Chaudhuri has completed or is planning some key medical, retail and senior projects in the Hemet and San Jacinto areas.A similar slate of upgrades is planned in the near future, in and around the Menifee hospital. Those improvements will be anchored by a three to four-story 60,000 sq.ft. medical building, visible from Interstate 215 and will feature a campus setting. The campus will feature a senior wellness center, a congregate care building, a custodial care building, food services and vascular and neurosurgery units. A vacant Walmart store has been transformed into the KPC Town Center in Hemet. His San Jacinto project – termed the KPC Promenade – is located between Main Street and Ramona Expressway. That plan includes a hotel, medical building, outpatient center and restaurants. An 80-unit senior apartment building that would feature ancillary healthcare services is also in the planning stages for the region. Dr. Chaudhuri said the broad swath of land that stretches from Orange County to Hemet has become a firm base to fulfill his dreams of sharing his South Asian culture, heritage and values.